On March 12, Darrell Samson, Member of Parliament for Sackville—Preston—Chezzetcook, on behalf of the Honourable Ginette Petitpas Taylor, Minister of Health, paid a visit to campus to highlight a recent federal investment in health research. 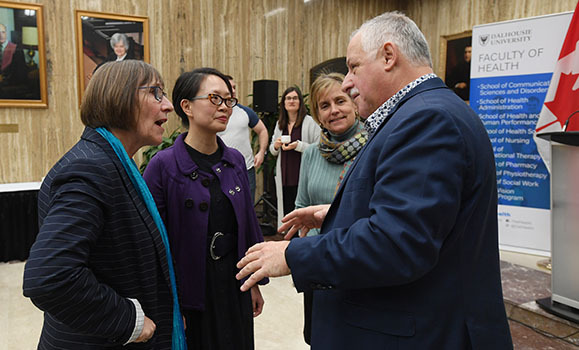 Dr. Cheryl Kozey, Acting Dean of the Faculty of Health, welcomed Mr. Samson, who met with grant recipients to celebrate their achievements and learn more about their research projects. Seven researchers affiliated with Dalhousie and the NSHA received $3.4 million in funding from the Government of Canada, provided by the Canadian Institutes of Health Research (CIHR) Project Grant Program. Among those receiving funding are Faculty of Health researchers Dr. Margot Latimer (Nursing), Dr. Debbie Martin (Health and Human Performance), and Dr. Catherine Mah (Health Administration).